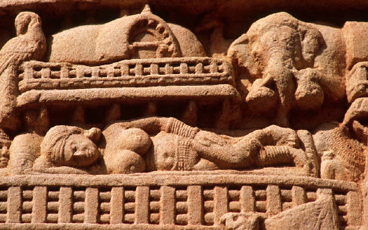 The reliefs of the Sanchi stupa form the most important visual record of life and architecture in the Sunga period. The Great Stupa, North Gateway, an inner view. THE art of the Sunga period, from 185 B.C. to 73 B.C., laid the foundation for the rich traditions that followed in later centuries. The harmony and interrelatedness of the whole of creation becomes the underlying theme in Sunga art. There is always the continuous, undulating vine of life, which brings before us the bounty of the numerous forms of the world around us. These forms are presented with an appreciation of their beauty and their bounteous fertility, which ensures the continuity of life. These forms of the world are made on the railings and gateways, which separate the ordinary, day-to-day world from the sacred interior. Their representations help us appreciate all forms of life in their true perspective, as reflections of the formless eternal Truth towards which we must proceed. Beyond the railings and gateways is a profoundly simple representation: a stupa, to point out the Truth towards which we must strive, leaving behind the attractions of and attachments to t he world. Worthip of Stupa, pillar of the North Gateway. 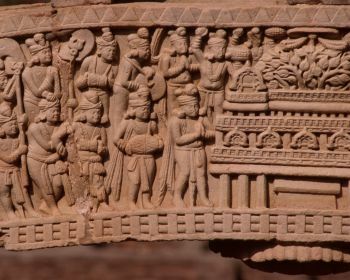 As individual personalities were not shown in Indic art at this early stage, symbols such as this stupa indicate the Buddha in the art of Sanchi. Another tradition that was clearly established at this time was that of the king’s patronage (always indirect in the early period) of all sacred monuments. 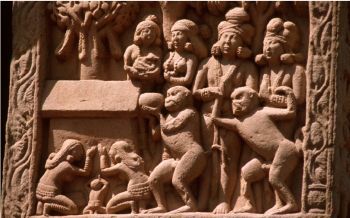 The earliest Buddhist art, with themes of the Buddha’s life and the J ataka stories, was made under the rule of Sunga kings, who all worshipped Brahmanical deities. These rulers generously set aside the revenue of many villages for the running and maintenance of Buddhist places of worship. 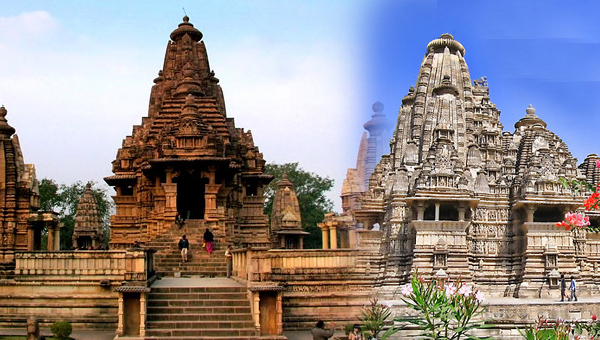 The city of Vidisha, present-day Besnagar in Madhya Pradesh, was on the trade route that connected the plains of the Ganga to the western coast. It was also a great marketplace, at the centre of the vast and fertile plains of central India. Among the earliest objects to be found there is a large stone pillar with an inscription on it, dated to about 120 B.C. to 100 B.C. It was set up in honour of Vasudeva, a name of Vishnu, by a Greek devotee named Heliodorus. 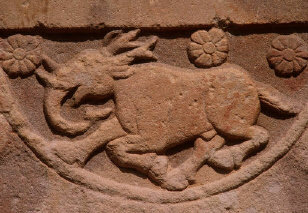 Composite creature, Stupa II. The depiction displays the oneness of all life forms. It is a delightful and joyous creature, with the features of an elephant, a cow, a deer and even a horse. All of creation is seen in a vision full of warmth. 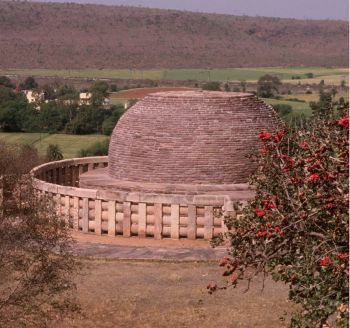 At Sanchi, on a low hill next to Vidisha, are the finest surviving early Buddhist stupas. Half-way up the hill is a stupa that contains the remains of prominent Buddhist teachers of the Maurya period. The railings , or vedika, made around the stupa date to around 100 B.C. The vedika has medallions and half-medallions with reliefs. The corner pillars at the entrances are fully carved. The deity of prosperity and abundance, Lakshmi, is shown being lustrated by elephants, who pour water over her. The re lief is shallow and the style is similar to that of Bharhut. Shalabhanjika, East Gateway. 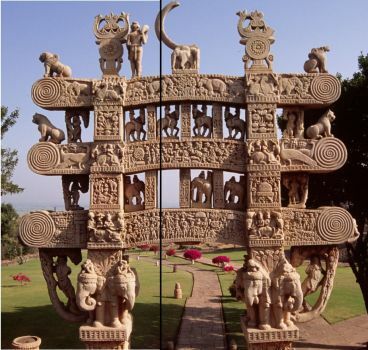 The bestknown sculpture of the Sanchi stupa is this exquisite "shalabhanjika", who depicts the fertility and abundance of the world of nature. The greatest surviving Buddhist stupa of the B.C. period is on top of the hill at Sanchi. It is likely that it would have enshrined the relics of the Buddha. The stupa was originally made in the 3rd century B.C. T here is an Asokan pillar at the southern entrance of the stupa. In the middle of the 2nd century B.C., the stupa was doubled in size and its older wooden railings were replaced with massive stone ones. Stupa II, c. 100 B.C. Made in Sunga times, the sculptures on the vedika, or railing, of this stupa are among the oldest surviving examples of Buddhist art. These depictions continue the rich, visual lore of the land and show the roots of the specific Buddhist imagery that was to come in later centuries. By the end of the 1st century B.C., the Satavahanas, kings of the Deccan region, extended their rule to central India. They worshipped Hindu deities. However, major stone renovations carried out in their time made this stupa one of the most significant of all Buddhist monuments. 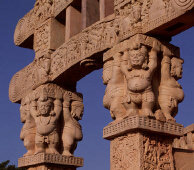 Four gloriously carved stone gates, or toranas, 34 feet (10.4 metres) high, were made. They were completed in the 1st century A.D. The traditions of art established in the time of the Sun gas achieved greater sophistication in these magnificent toranas. The Great Stupa, East Gateway, inner view. The vedika creates a passage for circumambulation. Six hundred and thirty-one inscriptions on the toranas tell one that the carvings were the donations of the people of Vidisha. The art was created for gardeners, merchants, bankers, fishermen, housewives, householders, nuns and monk s. Almost half the donations were from women. The massive vedika is plain and without carvings. The toranas have two upright pillars, which support three horizontal bars, or architraves. Between the pillars and the architraves, on the east and on the north, a re superbly made elephants. The western gateway has dwarfs. The one in the south has lions. 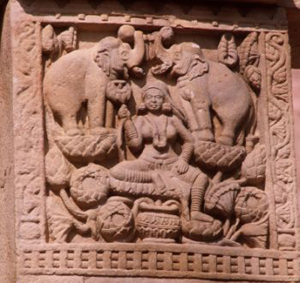 Lakshmi being lustrated by elephants, East Gateway. Also interpreted as Queen Maya, mother of Prince Siddhartha. 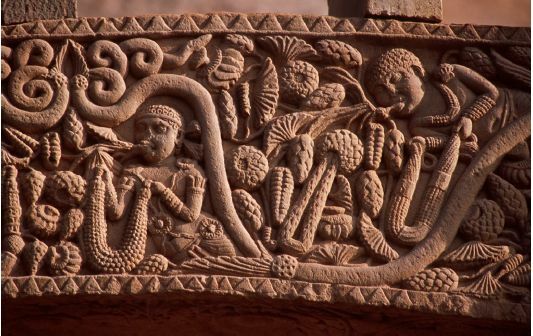 From the earliest Sanchi stupa and the Bharhut stupa onwards, one of the earliest deities seen in Indic art is Lakshmi, who represents the abundance and riches of nature. The dwarfs, or ganas, have rolls of fat and vast bellies, which bulge over their dhotis. They have individualised facial expressions. Ganas continued as a favourite motif of the Indian artist in the centuries to come and as an important theme in the temples of Siva. They deepen the sense of the reality presented in the art, where the humorous and the sublime coexist, reminding us that everything has its place in creation. The veneration of nature’s fertility and abundance, as seen at Bharhut, continued here. Twenty-four auspicious women were made as bracket figures on the gateways. On the eastern torana is a beautifully made yakshi, who holds a branc h of the mango tree above her. The notion of the creative vitality of nature and its fruitfulness is convincingly portrayed here. Though she is physically attached to the matrix, she is treated as though fully in the round: all the details have been carefully articulated on the rear too. Worship of Seven Buddhas, represented by trees, East Gateway. The seven Manushi Buddhas are the Buddhas, or Enlightened Ones, of the world, of whom Gautama Buddha is one. As individual personalities were not yet shown in Indic art, they are represented here as trees. As at Bharhut, we pass male figures at the entrances. One figure is in Indic garb, a dhoti and turban. Another wears Greek garments and carries a foreign type of shield and spear. Indra with "VAJRA", pillar of East Gateway. Indra is one of the earliest deities seen in Buddhist art. The "vajra", or thunderbolt, which he holds, later became the symbol of the Vajrayana school of Buddhism. The reliefs on the toranas bring us the Jatakas of the Buddha’s previous lives as well as events from the life of Gautama Buddha. The setting of the stories richly reflects the life in the towns and villages at the time when the art was created. 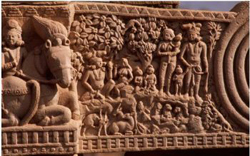 The Sanchi reliefs are the most important visual record of the architecture and lifestyles of the period. Queen Maya's dream, East Gateway, an excellent example of a narrative scene. According to Buddhist lore, the Buddha came to Queen Maya as an elephant in her dream and entered her womb. The focus is still not on the personality of the Buddha. “Buddhahood” is still represented by symbols. The wheel represents the first teaching of the Buddhist dharma, the Bodhi tree represents Enlightenment, while footpr ints and an umbrella over a vacant space proclaim the presence of the Enlightened One. Monkey brings Honey for the Buddha, pillar of the North Gateway. When Siddhartha decided to give up his extreme asceticism, a monkey brought honey for him to eat. Siddhartha had realised that depriving his body of nourishment in rigorous self-denial only weakened his body and mind. He needed the full and positive health of his mind to concentrate and meditate best. Mara's army, north Gateway, inner face. When the Buddha achieves Enlightenment, the armies of Mara are frustrated beyond measure. They represent the confusions, greed and anger present in our own minds, which keep us away from the correct path. d in the midst of exuberant life. They are no longer depicted only frontally; instead three-quarter profiles are also seen. The Sanchi artists depicted a wide range of expressions effortlessly. 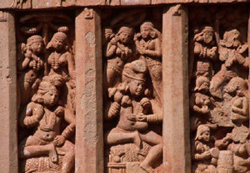 The Sanchi artists utilised multiple perspectives and viewpoints. This allowed them to present the view through which the object or person was most easily recognised. Events that occurred and figures that are in the distance are represented in the upper part of the panel, while those figures that are closest to the viewer are shown in the lower section. The technique of receding perspective is not employed here. As all elements are considered important, they are presented large and in clear detail. Another feature of Indian art seen from earliest times is making the leaves of a plant or tree large so that they could be recognised. "GANAS" supporting architraves, West Gateway. "Ganas" are among the early images of Indian art that continued through the ages. They deepen the reality conveyed in the art, as the whole of life includes multiple aspects, from the humorous to the sublime. Another, smaller stupa at Sanchi contained the relics of the Buddha’s close disciples Modgalyana and Sariputra. The one torana here was also made under the supervision of the Satavahanas in the 1st century A .D. As in the earlier stupas, here is a vision of the world that sees the unending rhythm in all of creation. The vine of creative blossoming moves with a pulsating life through the vedika. It brings to us life in ma ny forms: flowers, fruit, animals, humans and mythical creatures. Vessantra jataka, north Gateway, inner face. Prince Vessantra is a previous incarnation of the Buddha. In this Jataka, he exemplifies the quality of generosity. He gifts everything that he has and is left with nothing. 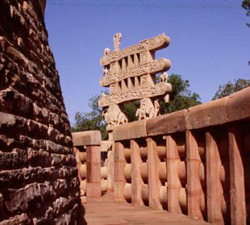 The stupa at Sanchi has an inscription on the eastern gateway that mentions that the exquisite carvings on the gateways are the work of the ivory carvers of Vidisha. The unending vine of the natural life force, South Gateway. 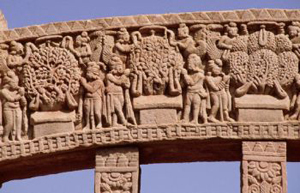 The art of Bharhut and Sanchi brings us the undulating vine, which carries the numberless forms of the natural world. Indeed, the stone is so finely carved here that it reflects the care and detail of work on delicate ivory. In the meantime, the Satavahanas and the Kstrapas ruled over the vast western and eastern Deccan regions. While the kings personally worshipped Brahmanical deities, they encouraged Buddhist establishments. Scores of caves dedicated to the Buddha and numerous impressive stupas were made during their rule. Graceful devas, enlightenment scene, West Gateway, inner face. 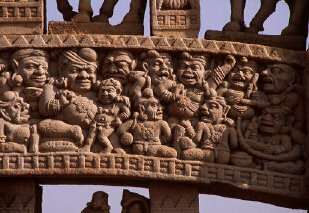 This scene is one of the finest sculpted at Sanchi, with gentle and graceful expressions on the faces of the figures. These devas are gathered on the occasion of the Enlightenment to pay homage to the Buddha. Benoy K. Behl, art historian, film-maker and photographer, has done pioneering work in documenting India’s art heritage. He has taken over 30,000 photographs of Indian monuments and art objects and made 100 documentaries on art history. His exhibitions have been held in 24 countries.